The name is - drum roll - "Everything But Freebies". It was the first name I thought of and it kept turning up in my mind all through my long name search. The not-so-nomal thing about it is that it's a Trust Store. You probably know the concept from other places - the farmer's stall by the road or candy/snacks at work. It simply means that you can download directly and THEN pay for your download(s) by donating via PayPal = I trust you. You can read more on how it's done here. AND - I will keep the prices as low as possible: Most products will be 1$ or 2$ a few a little more but NEVER more than 4$ and that is only for the big kits. I must say that the store is still a beta version = not totally final in layout, concept, etc. and I have not yet uploaded all the products. But it's a pretty good start and you will currently find 16 products available (all former SIS products) and new will keep coming. I will keep you informed about new store products here on NbF. Please go check it out and feel free to let me know what you think. From now on you will find this on ALL my creations, both NbF freebies and EBF products. One designer - two outlets. Please don't worry. This new store does NOT mean that I will forget about the freebies. I will continue NbF just the way it has always been. And on top of that you will over the next month or so get freebies that were formerly SIS products but now free for all. The first one is here today. 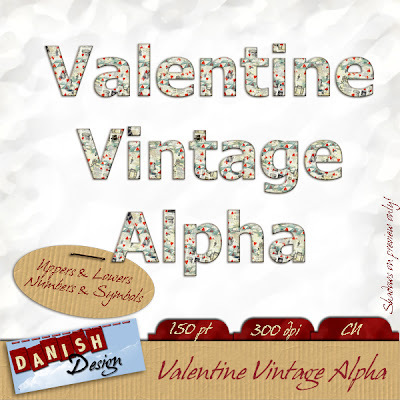 A full Valentine's Alpha (yeah, I know) that can be used for so much more than Valentine's. I hope you'll enjoy it. Thank you for making it all the way to the end of this long post. I'll see you again very soon. I'm so glad you took the leap and opened your own store! Yay! will stop by tomorrow! thank you so much for the beautiful alpha! Your new store is fabulous Trine. Good Luck with it!